Fail to convert Music DVD and Family Movies to iTunes 12/11 with Handbrake? Great news: As promised, Apple’s next-generation OS X Yosemite Mac operating system is now available for download through the Mac App Store, bringing with it a host of enhancements like iOS Continuity, a redesigned UI, iTunes 12 and more. iTunes is criticized for not being able to transfer music file from one portable device to another. Similarly, iTunes 11 and 12 require the purchase of HD movies from iTunes Store. In case that most of us have a large DVD collection, it will be great if you could watch a DVD on an iPhone 6/6 Plus, iPad Air 2, iPad Mini 3, iPod Touch 5 and more via iTunes? Whether it is for storage or preserving the movie or carrying the movie in digital format the task can be accomplished in a number of ways. How to Rip a DVD to iTunes 12/11 with Handbrake? For ripping DVD movies, Handbrake is highly acclaimed by numerous users. The following elaborating tutorial will illustrate you how to rip DVD to iTunes 12/11 with Handbrake without any hassle. Step 1: Free download the latest Handbrake and Launch it. Step 2: On the “Source” field, click “Browse” button and opt for DVD resource you want to rip from a new window popped. Step 3: On “Destination” portion, select the output path where you want to save your new converted file by clicking the “Browse” button. Step 4: Move your mouse to the “Output Settings” field, and choose iTunes compatible mp4 format as the output video encoder from the “Encoder”. Step 5: Now simply click “Start” button at the very top of the main Handbrake window to rip DVD to MP4 format. After all the above steps, just quietly wait and let Handbrake do the rest for you. Although Handbrake is a terrific yet gratis software that can rip and convert DVD video to common file formats, it contains an Achilles’ heel: impotent to rip any encrypted protection DVD on its own, even the common region code 1-6, RCE, CSS, UoPs, Sony ARccOS, let alone the latest Disney X-project DRM . 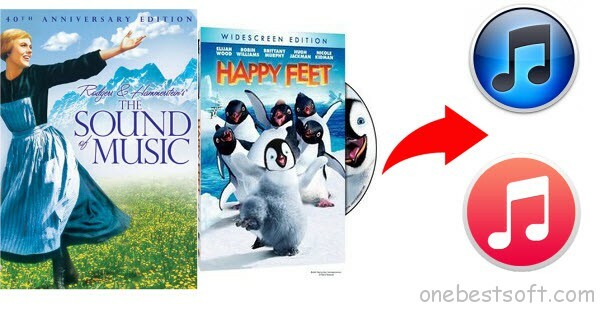 It can’t work with copy-protected DVD unless it receives assistance from third-party software and libraries. Fail to convert Music DVD and Family Movies to iTunes 12/11 with Handbrake? Have no clue? No biggie, many success find its alternative way as below. For those who wanna rip any DVDs (including Music DVD, Family Movie and sDisney encrypted DVD like Frozen, Monsters University and Oz The Great and Powerful) to iTunes 12/11 for playing on idevices, you don’t need to waste time to download third-party software for Handbrake, here recommends you a Handbrake alternative- Pavtube Video Converter Ultimate– which I have only had it for a week or so but love it! It works well and very easily as the coolest tool to convert your DVD to iTunes 12/11 playable video formats with perfect video quality. Besides converting DVD to iTunes, it worry-free converts Blu-ray, DVD and videos to any format in a flash! Besides, you can crop the black bars, add special video effects, split or merge videos, etc. as you like with the built-in editor. Now just get it and rip DVD movies to iTunes 12/11 supported videos for playback on your all iPad, iPhone, iPod and Apple TV models. The equivalent Mac version is iMedia Converter for Mac. Click the disc button to browse and import DVD disc from ROM, or load the ISO/IFO files that you want to convert for viewing on Apple iOS-based devices. Pavtube Video Converter Ultimate will detect and list the main title (the full length of this movie with all the chapters) and check it by default. So just keep it untouched and let’s move on to Step 2. For example, if you own an iPhone, iPad, iPod, just choose the best profile from iPad/iPhone/iPod column. Read how to Backup Instructional DVDs to iPhone/iPad/iPod. Click “Settings” button to configure target file quality. 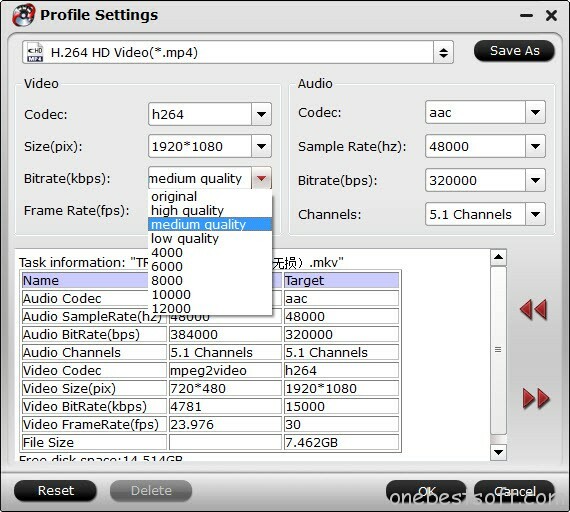 After entering “Profile Settings” panel, you are allowed to adjust video and audio parameters such as bit rate, frame rate, sample rate, etc. If you prefer a much better video quality and don’t mind the output file size, you can rise the video bit rate higher than 4000. Generally speaking, the higher video bit rate will result in the larger output file size, and vice versa. Now hit the big red “Convert” to start converting rental DVD movies to MP4 for iTunes with best settings and playback on different idevices. 1. Launch iTunes 12/11, add the movie video file to your iTunes library, create versions optimized for your device using the Advanced menu. 2. Click “Add to File” under “File” and browse and add the converted DVD video to your iTunes library. iTunes 11 will auto classify it in Movies category. You can play it directly on iTunes. 3. Drag the DVD movie to your iOS device including iPhone, iPad, iPod, etc. from iTunes library. Or you may sync the video to iPad iPhone iPod. After that, you have successfully transferred DVD video from iTunes to iOS device for playback. In a word, as as Handbrake alternative, Pavtube Video Converter Ultimate/iMedia Converter for Mac may help you to rip/copy protected DVDs to iTunes 12/11 with ease on PC or Mac. And you can have DVD videos in iTunes library as many as possible to enjoy HD videos without buying. It is fair legal to backup your own DVDs for non-commercial use. Your Handbrake no work issue will be resolved. iTunes can currently read, write and convert between MP3, AIFF, WAV, MPEG-4, AAC and Apple Lossless (.m4a). Besides DVD, you can also convert Tivo Recordings and Youtube videos to your iTunes for syncing.